I pinned this project on Pinterest probably a year ago and told myself that I'd make some time to try and do it but it just never made it to my to do list. On Friday of last week, I was reading up on one of my favorite blogs and saw that she made one. I thought if a new mom could find the time to do it, then i could find the time so I got to work. This project is so SUPER easy even if you are new to sewing. 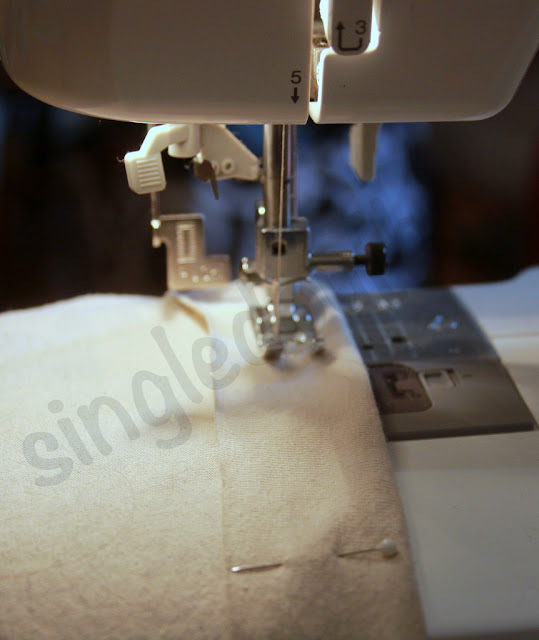 If you can sew a straight stitch you are good to go. I thought I'd show show you how I made it, but I am also going to link to the other sites that I saw first. Step 1: Find a tshirt. For your first time, you might want to start with one that you wouldn't cry if it didn't work out. Its a pretty easy project but I'd hate for you to lose a fav shirt. 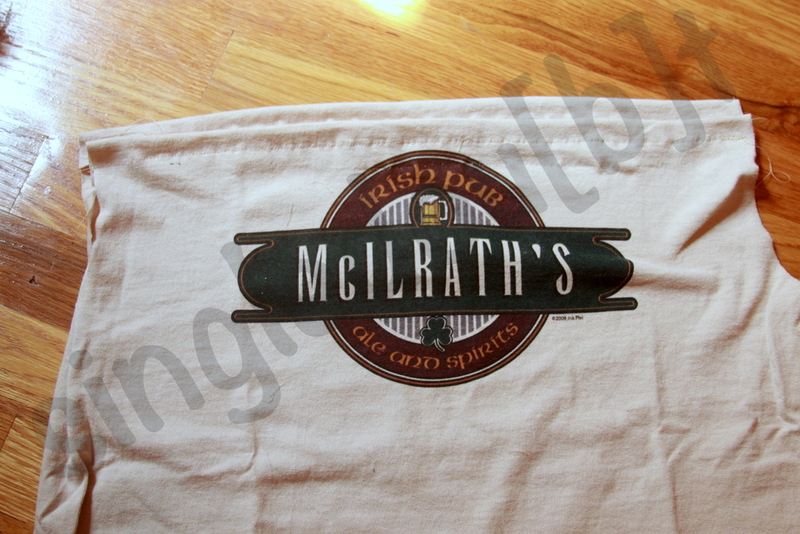 Knowing I'd post this project, I picked this shirt because it shows my family name. Wanted to give my rentals parents some props. You'll see this shirt is fairly wrinkly... its ok. it won't get in your way. 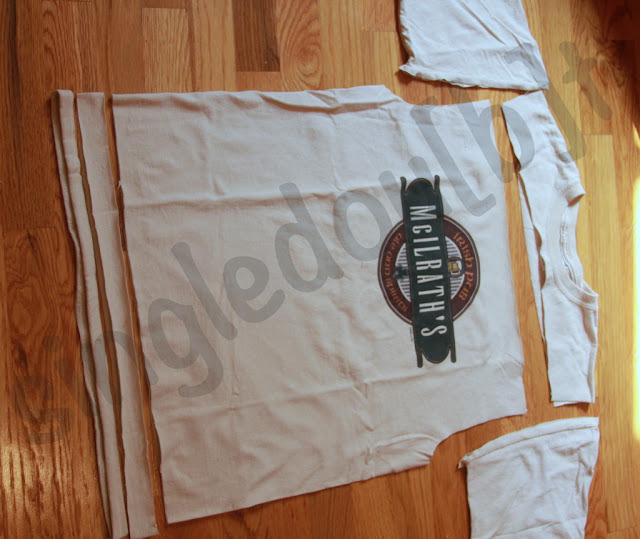 Step 2: Cutting the shirt. A) Cutting the sleeves - I used a fabric cutter. It really saves time and energy and helps with accuracy. Cut just past the seem. You'll do this with both sleeves. B) Cut the collar - I used this yard stick to help mark where I was going to cut and as a guide. C) Cut the Bottom - You are going to make 2 cuts. 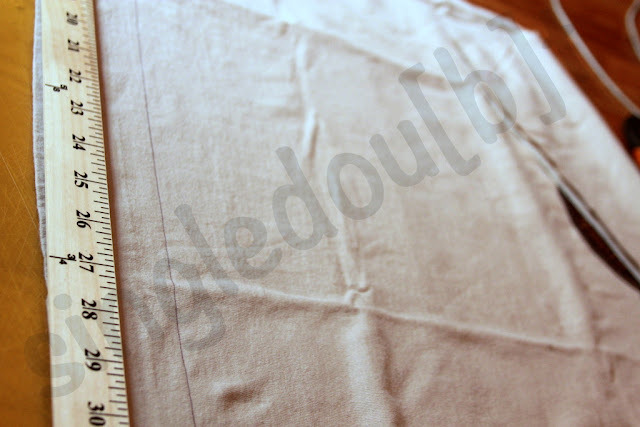 The first is the edge, just above the hem. This piece will be scrap. The second is about .5 - 1 inch aboce the first cut. I used the yard stick width as my marker. This piece will end up being your straps. This is what you'll have after the cuts. Step 3: Pinning and Sewing. The only sewing you will have to do is the top seems. 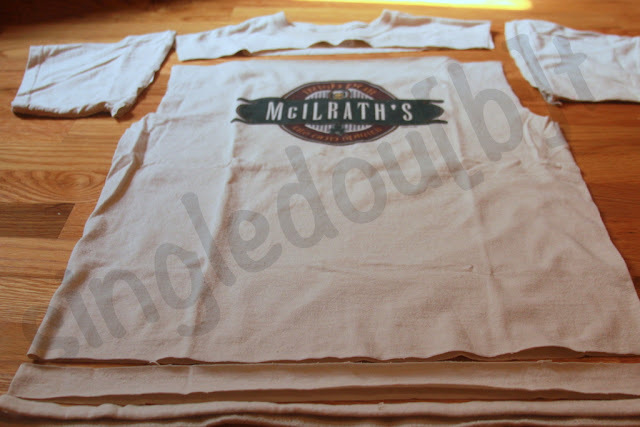 If you have a sewing machine, it will take you 5 minutes tops. 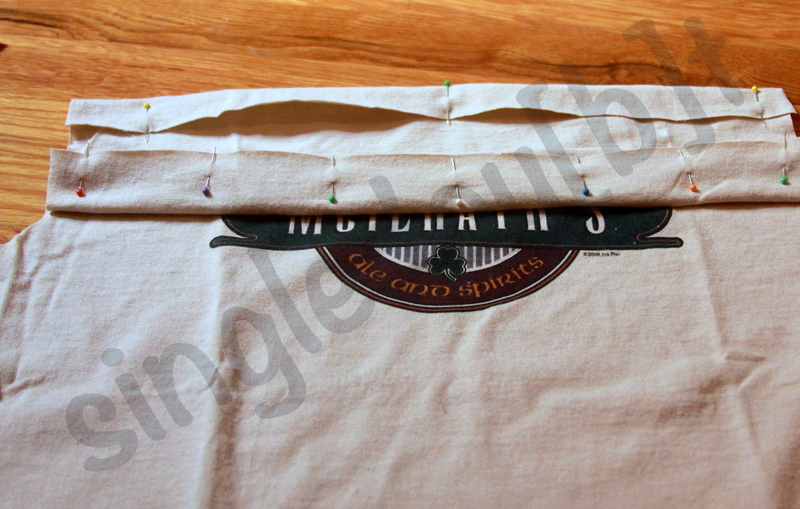 First, you will fold the two top sections (front and back) over and pin in place. 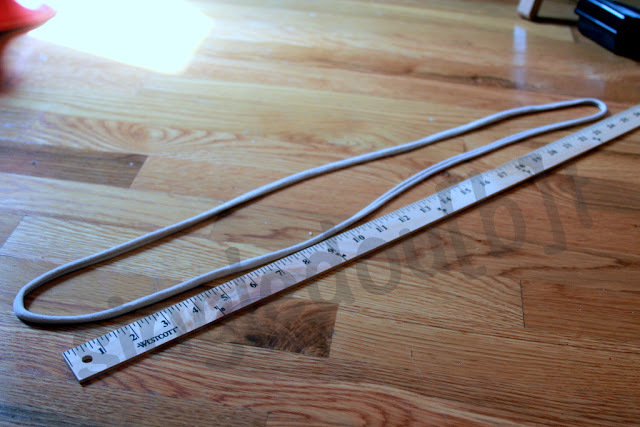 Your seem will be about 3/8 to 1/2 inch wide. Make sure when you fold over and pin that you account for where the line of the seem will be. You might not want it cutting off any of your front image. Next you'll sew the seem. I used a straight stitch about .5 inches from the fold. I used the top of the foot as a guide leaving a 1/4 of an inch from the fold. You can see that I have a lot of space under the seem. You can cut that off after you are done. Keeping it on as i sew helps weigh it down during the sewing. This is what you will have at the end. Step 4: The strap & edges. With both the strap and the edgees of your shirt, you won't have to sew a hem. 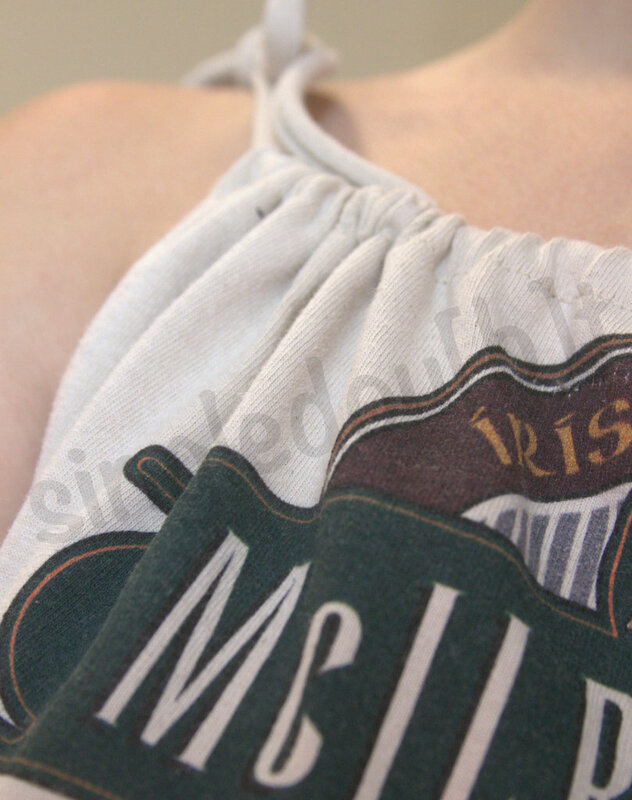 T-shirts don't seem to fray. They kind of just curl under. 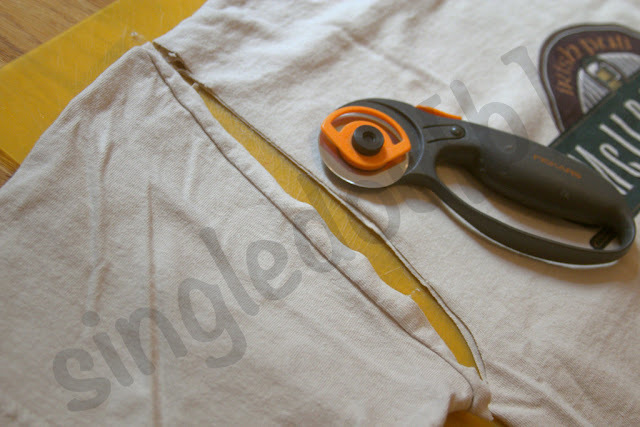 For the strap - If you pull the loop tightly the edges will curl under. It will naturally do something like this. 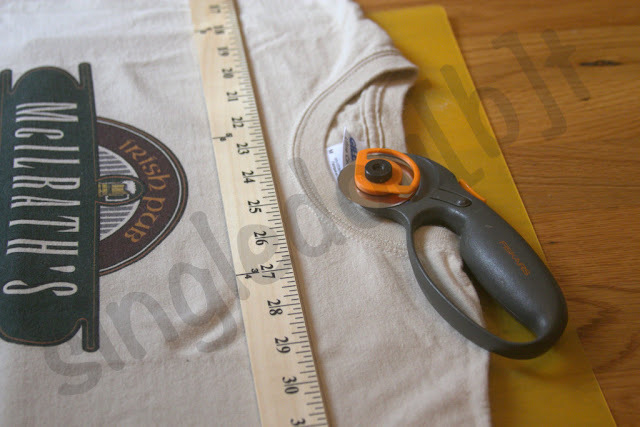 Next, you'll cut just one end of the strap. 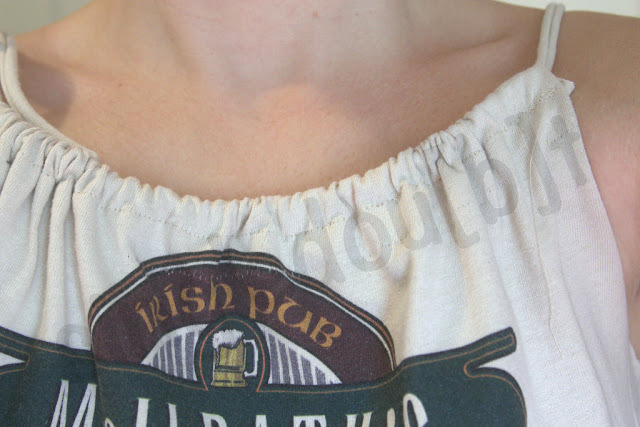 You don't need to cut two ends unless you want two shoulder ties. I was fine with one shoulder tie. You can kind of see it at the top. I pinned a safety pin on one end to help me feed it through the newly sewed seem. Using the safety pin helps guide it through. 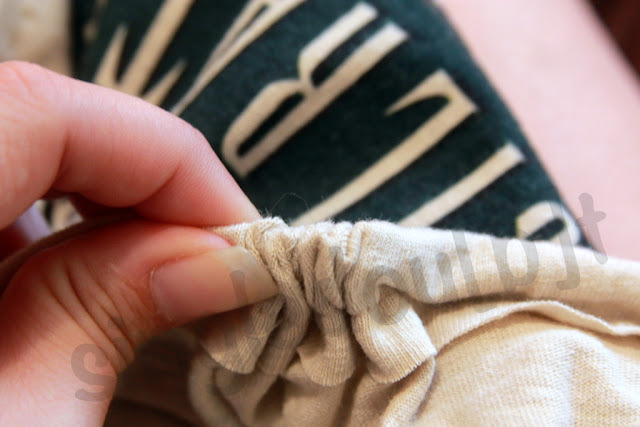 You'll gather as much fabric as you can by pinching it closer to your other hand. 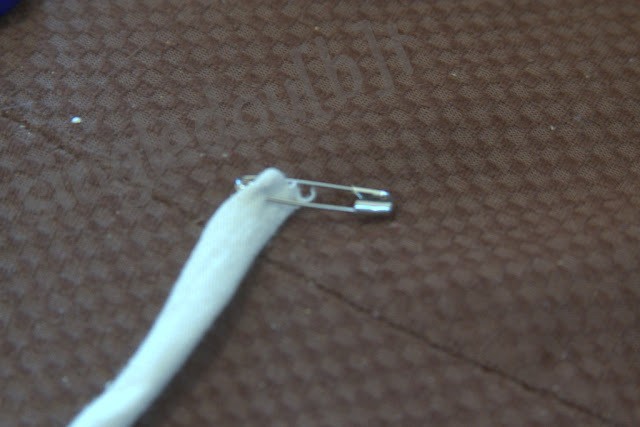 Then with your gathering hand, pinch the safety pin and with your other hand pull the fabric back. Keep doing this until you go through the entire shirt. YOu'll go through both sides of the shirt. Lastly you will have the two loose ends on one shoulder. Tie it in a bow. Gather the front and back to the desired width and there you have it. One new tank. I plan on doing this with more of my shirts. I have a whole "under the bed" container with them. If you make one, please link to it back here on my comments so i can see what you did! I love seeing what other people do with theirs. If you have any updates, changes or recommendations let me know that as well. I love trying new things. PS - Keep a look out for this Pinterest Repurpose Creation on my blog. Best tutorial EVER!! I'm pinning it! Ah! I have no sewing machine! I'm going to need to no-sew tutorials. LOVE IT!! So original and FUN tank top! !